Level 3-6+ is the sixth level of Fire Mountain Plus in Mario vs. Donkey Kong. The high score for this level is 21000. The player first needs to jump up a set of stairs and pick up the Katakata Kaen Heihō, then throw them to the left. A Firebird will appear from above, and the player then needs to move across a red platform while avoiding Lava Bubbles jumping up from below. After collecting the Mini Mario to the right, the player needs to move back across the bridge, returning to the stairs. The player then needs to pick back up the Katakata Kaen Heihō and throw it to the right of the stairs, then climb up the ropes while avoiding the Firebird. 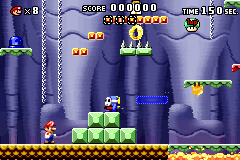 After pressing the blue Color Switch to the left, the player needs to jump to a few sand platforms, leading the Mini Mario up the new blue ones, while still avoiding the Firebird. Once the Mini Mario gets to the end platform, the player needs to press a red Color Switch, allowing them both to reach the locked door. Red: Next to the ladder, above the Mini Mario. Yellow: On the sand platform, above the Firebird's fire ring. Blue: Next to the locked door, which only the Mini Mario can collect. This page was last edited on August 14, 2018, at 15:40.